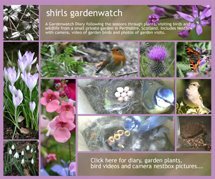 shirls gardenwatch: One week on…..
Last Monday I posted ‘Surprise, Surprise’ as I discovered four chicks in our Camera Nestbox. Later that morning chick number five hatched. What a difference we have seen in these chicks in only a week! 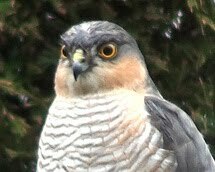 They are slightly fluffier now, have wings developing, larger mouths and are making their presence known in the nest! They are definitely getting stronger and growing remarkably day by day! The female is taking longer to settle them at night now and is clearly struggling to get comfortable sleeping with them! However, not all the chicks have grown at the same rate. The stronger ones are getting more of the food now and sadly the younger ones weren’t even lifting up their heads to open their mouths this morning. The size difference between the first five chicks and the other three was at its greatest today. My first impressions this morning when I saw the chicks in the nest were of serious concern for the younger three chicks. They lay near the bottom of the nest cup and I wasn’t sure I could even see the youngest one move much at all. When food came in the stronger chicks just climbed on top of each other and the smaller birds were pushed further down into the nest. I kept hoping the male would notice the younger ones as he seemed better than the female at checking on them all. 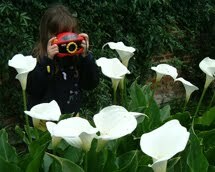 Sadly, I believe sometime during the afternoon and early evening we may have lost three of the chicks. It is difficult to count them all – but I am pretty sure that the younger ones didn’t get any food today so I cannot see how they could have survived anyway. When chicks die in the nest I believe the male or female will remove them to keep the nest clean for the others. I have looked and looked at the nest and I am not exactly certain on how many chicks we still have. 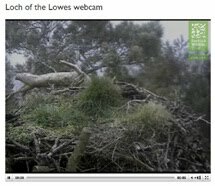 I now have mixed feelings about switching on my PC tomorrow and looking in on the nest – although I have always been aware that not all the chicks may survive. 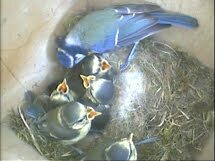 The picture above was taken in the Camera Nestbox this morning when I believe all eight chicks were still present.